Want a small dash of garlic that delivers big flavor? Rather than mincing a full clove of garlic by hand, use this minced garlic, which is packed in water for long-lasting flavor and texture! Featuring a wholesome flavor and authentic taste, garlic in water features a more mild taste than comparable garlic packed in oil. Perfect for bringing true Italian elements to any pasta dish or making warm and fresh garlic bread, it's sure to deliver distinct, full-bodied garlic taste in any recipe you choose. Versatile and convenient, this minced garlic in water is a must-have addition to your Italian restaurant, pizza or sandwich shop, and more! Mincing a full clove of garlic by hand can be tedious and time-consuming. With this already preserved garlic in water, you can shorten your preparation time and therefore provide faster and easier service to your hungry patrons! In addition, this garlic is minced uniformly to ensure even cooking and a completed dish that is packed with real garlic taste. As opposed to chopped garlic, this minced garlic more easily disperses and blends with the other flavors of your recipes. 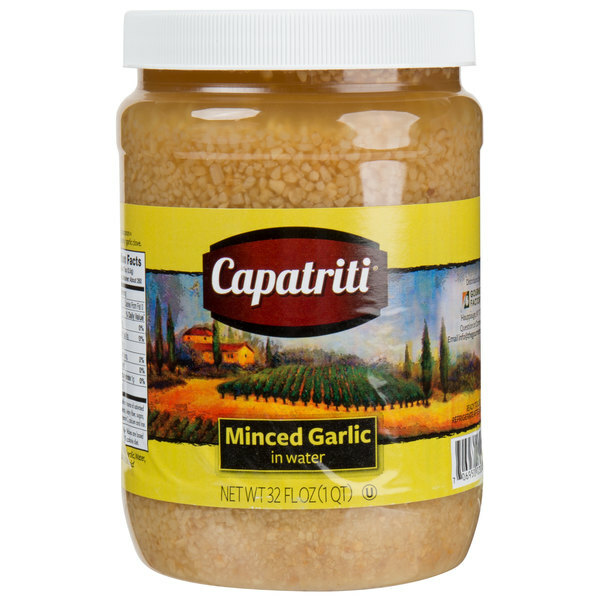 Use this minced garlic in water for chili, specialty meat rubs, marinades, or stir frys. 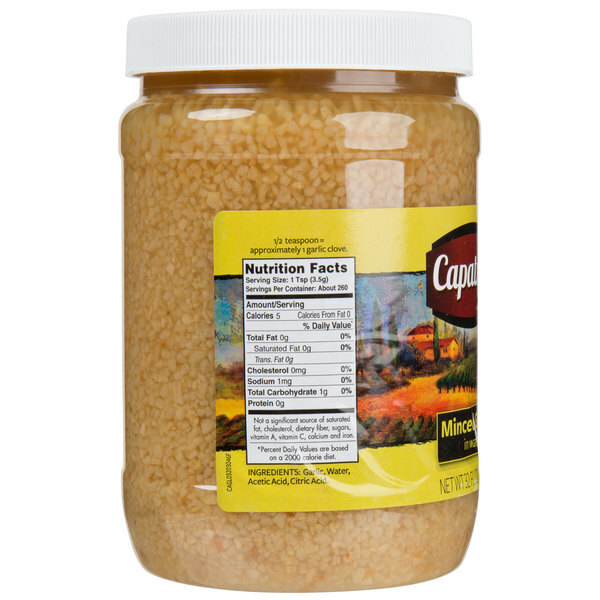 It can even be sauteed, spread on bread crusts, or included in flavorful seasonings and sauces. 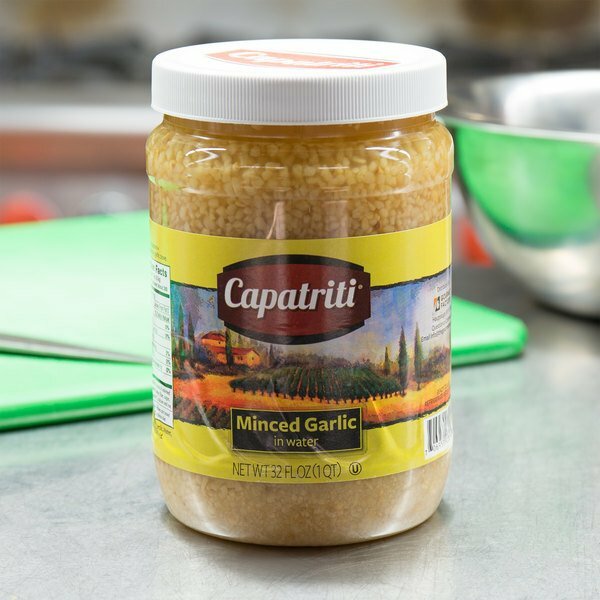 If you're looking to save time in your busy kitchen, while still offering flavorful menu items, this minced garlic in water is just what you need! We can't tell you what a life saver this is. We use so much garlic in our recipes. Some are cooked. Others are fresh. The minced garlic in water has a great garlic flavor and isn't as harsh tasting as other brands. Great value. Great minced garlic packed in water. I prefer garlic packed in water to garlic packed in oil because it does not change the flavor or add oil to your dishes. Great flavor, and convenience. The 32 ounce minced garlic in water is great and fresh. Smells wonderful and makes a great addition to our pesto. The garlic is amazing.